May you see with new eyes in 2010! Next week look for the debut of our photo of the week contest, which will highlight Madison’s unnoticed places. Also next week, we’ll be mounting a subpolar ice expedition (i.e. about 23.5° below the arctic circle), the exact nature of which we can’t reveal in case it goes badly wrong. Check back for photos, audio, and video, possibly of our last moments. In other news, our end-of-decade quiz has a winner: Robbie Webber, a former Madison alder now serving on the Bike Walk Madison steering committee. Robbie attributes her skillz to a lifelong interest in natural history. She wins a copy of Bob Birmingham’s new book about Madison-area effigy mounds, Spirits of Earth. Q. 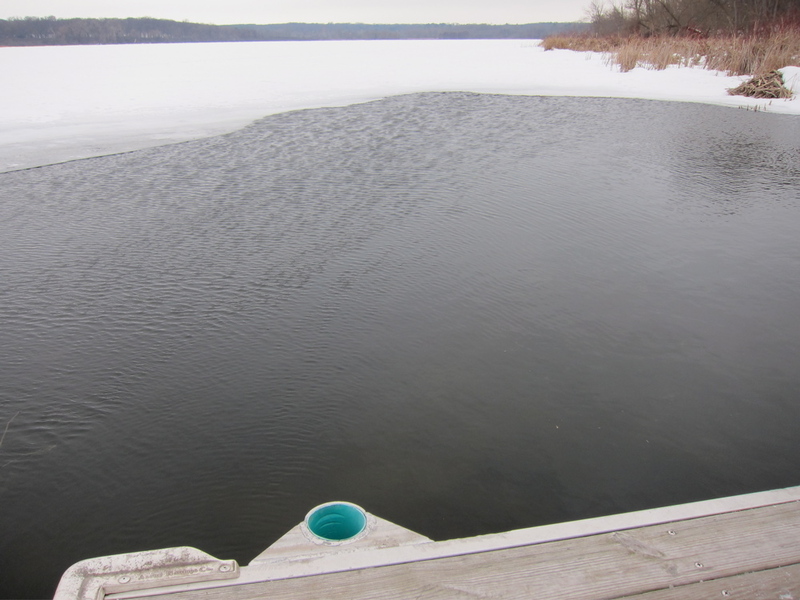 In 1855, the Yahara chain of lakes got a new set of names: Kegonsa, Waubesa, Monona, and Mendota replaced First, Second, Third, and Fourth lakes. Where did the names come from? A. Madison officials named them after consulting faulty vocabulary lists to find attractive Indian names. Q. Which tree species dominated the Four Lakes area in 1834? A. Oaks (white, black, and bur). Q. 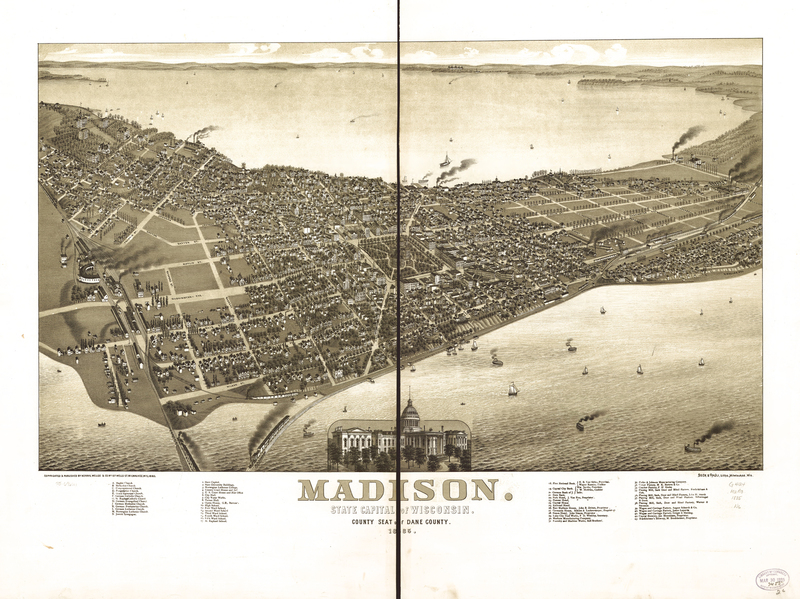 How many trees older than 1776 still stand in Madison? A. About 250. In 2001, Bruce Allison re-surveyed Walter Scott’s original 1976 survey. Though many trees on the updated list are gone or missing, Madison still has many old specimens. Q. How did the maple forest east of Lake Mendota (which gave Maple Bluff its name) survive in a savanna landscape that Native people burned regularly? A. Most prairie fires swept into the Four Lakes area from the west. Lake Mendota and the Yahara River stopped the advance of fires, allowing unresistant trees like maples to grow. Q. 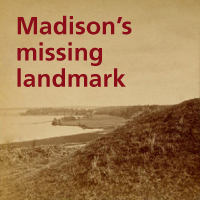 What landscape feature on the east side of the isthmus caused Madison’s factory area to develop there? A. You could write a book to answer this question, and thankfully someone has. Businesses and railroad lines built up around a mill on the Yahara River, but a large part of the east side lay under the Great Central Marsh. See the tidy but empty grid of tree-lined streets bisected by East Washington Avenue? That 1867 panorama didn’t match reality. The marsh covered the area between East Washington and Williamson. Used for a dump, it polluted residential wells, burned in the dry season, and often stank. Once the marsh was filled, factories used the newly available space.